Dr. Norman Ludwin is a Los Angeles native who began his musical studies on the piano with his father and uncle. After early experiments with trumpet, clarinet, and bassoon, he finally settled on the string bass as his primary instrument. He attended the California Institute of the Arts, where he received his Bachelors degree in Performance in 1977. After extensive work as a performer, Norman’s interest in composition led him to continue his studies, and in May 2003 he received his Masters degree in Composition from the California State University at Northridge. Norman received his Doctorate in Composition from the Claremont Graduate University in 2007. He has been a member of the Florida Symphony and co-principal bass in the Natal Philharmonic in Durban South Africa. He is currently principal bass in the Mozart Camerata, the South Bay Chamber Orchestra and the Symphony in the Glen. He has worked with the San Diego Symphony, LA Chamber Orchestra, Hollywood Bowl Orchestra, LA Opera, Pacific Symphony, Pasadena Symphony and the Long Beach Symphony. Norman’s compositions have been performed by a variety of groups worldwide, including recent performances by the Colburn School Orchestra de Camera, the Peninsula Symphony, the California State University at Long Beach Symphony, the Orchestra of the Humanities, the Lisbon Municipal Orchestra, the Pacific Composers Forum, the Debussy Trio, and at the Britt Music Festival. 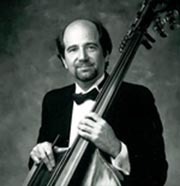 He has released two CDs of his own chamber music, and his music publishing company, Ludwin Music, is the world's largest catalogue of double bass music with over 300 titles. He is an instructor in the UCLA Extension Film Music Department and at the Professional Musicians Local 47, where he teaches orchestration and computer notation. He is the adjunct instructor for double bass at Claremont Graduate University and teaches double bass at the Claremont Community School of Music. He is also very active in the film-scoring world, having worked on several recent features including the films Up, Star Trek (2009) and Spiderman 3. He also played regularly on the TV shows Fringe and Lost. He lives in Los Angeles with his wife Paula and daughter Rachel.